This week I’ve received a few calls from consultants about high rice stink bug counts in late-planted rice and second crop. We don’t have recommendations for second crop rice in our publications, largely because this crop has not historically been important enough (economically) to protect. With advances in variety yield potential and improvements in second crop management, the second crop may be valuable enough to warrant protection (in some situations). This is an area where we need to spend more time on research. We would recommend that if the thresholds for first crop (30 per 100 in first two weeks of heading and 100 per 100 after first two weeks of heading) are exceeded in second crop, then you should consider using an insecticide. Click here to read more about rice stink bug biology and management. 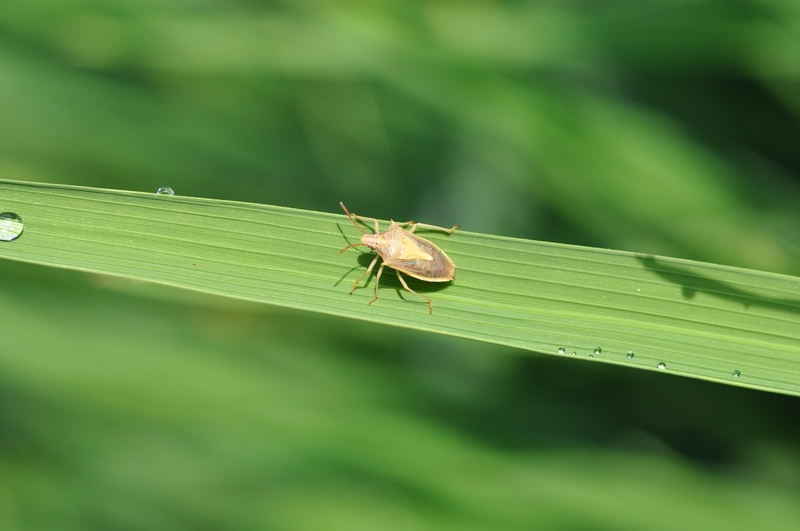 There are a variety of pyrethroid insecticides registered for stink bug management in rice and these can be used in second crop rice –as long as you observe the pre-harvest interval and any restrictions on the total amount of product applied during a single season. This season, we also have a section 18 approval for Tenchu 20SG – a neonicotinoid chemistry that I discussed in a blog posting you can view by clicking here. If you have severe pressure in your rice field, or you anticipate you will have to make a second pyrethroid application (because you are applying a little early in the heading of the crop) you may want to try the Tenchu. We have had one field location in north Louisiana where Tenchu was put out side-by-side with Karate. The infestation was severe with between 10 and 20 stink bugs per sweep. You could smell them when you walked across the field. 48 hours after treatment, the count was down to 3 per 100 sweeps in the Tenchu treated area and more than 30 in the Karate treated portion. The pyrethroid treated portion was retreated. This is an example of where this new chemistry might fit in certain situations. It appears to be a good fit in fields with high populations, if you anticipate an ongoing infestation (perhaps nearby fields are being harvested – making your second cropped rice one of the only places for rice stink bugs to infest), or if you are applying early in heading and expect to put out a second pyrethroid application. Remember that after hard dough the rice is no longer vulnerable to stink bug injury and while it is disconcerting to see rice stink bugs in the hopper when you are harvesting, they are not harming the crop. Of course, they will probably leave that harvested field and infest surrounding fields. Are you finding severe stink bug infestations in your region? It’s funny how when you work a field crop, life eventually moves in a pretty predictable cycle. Well, it’s that time of year again. Time to start scouting for rice stink bugs in headed rice, although it does seem to be coming a little bit earlier than usual. This is probably a result of very early planting of rice in some parts of south Louisiana. Unfortunately, field conditions are favoring a bad year for stink bugs. The drought conditions have killed off grasses that would normally serve as a host/reservoir for stink bugs, so there is a chance they will move more readily into heading rice. Recent reports from Arkansas and Mississippi indicate that large populations of rice stink bugs are present in the mid-south. We are already finding them in headed rice fields at the rice research station in Crowley, La. Last Friday, Johnny Saichuk and I scouted a variety trial in Vermilion Parish where the CL111 was heading first and was already infested with rice stink bugs. 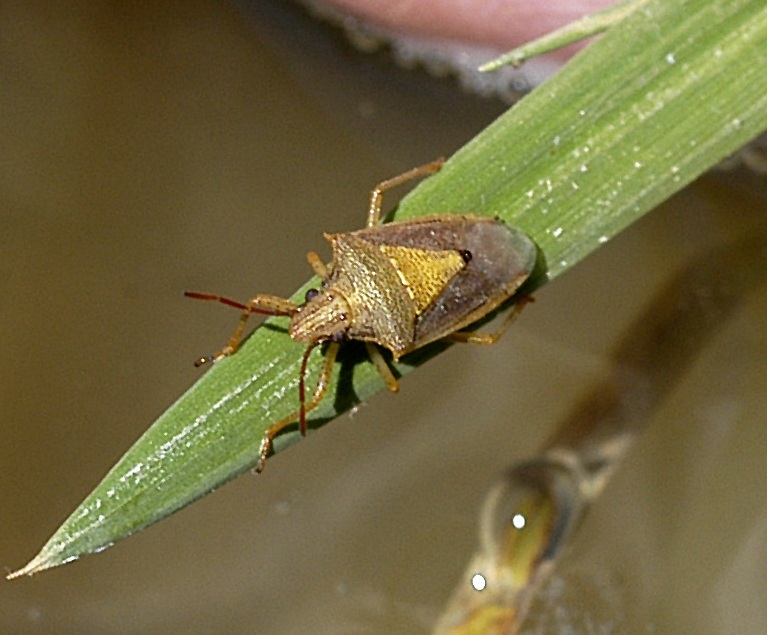 Rice stinkbugs are light tan in color with points on the corners of the pronotum. I received a call about the field because they noticed quite a bit of blanking in the panicles. They also found a high population of grasshoppers and suspected they may have been causing injury. Longhorned grasshopper adult in heading rice. You can tell it is an adult because of the wings. When we assessed the situation, Johnny determined that the blanking was most likely physiological, some sort of effect of weather conditions when the rice was at panicle development (pd). You can read more about it in his field notes. If you don’t receive Johnny Saichuk’s Field Notes via e-mail, please send Johnny an e-mail to be added to his list: jsaichuk@agcenter.lsu.edu. As we examined the grasshopper situation, we found that the grasshoppers were long-horned grasshoppers, which are typically predators. 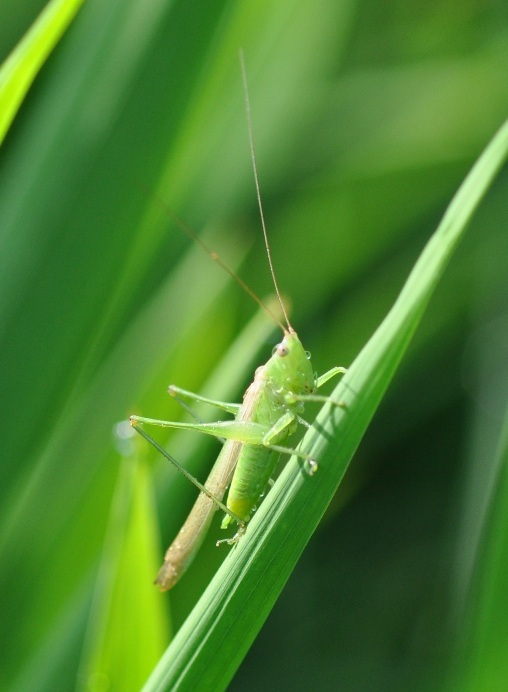 We would not recommend treating for grasshoppers unless they are causing excessive defoliation. Click here to read more about long-horned grasshoppers in rice. Odds are that they were attracted by the rice stink bugs, which we did find to be abundant in the field. We advised holding off on an insecticide application until the rice reached 50% heading. It is very tempting to put out a pyrethroid with the fungicide application at early-heading, but research has shown that this is too early to prevent injury. Putting out an early application will probably just add to the number of times you need to spray the field, while not providing any additional protection. To learn more about rice stink bug management click here. We have a graduate student, Bryce Blackman, who is currently studying rice stink bugs for his dissertation research. One aspect of his work is to re-evaluate treatment thresholds. At the moment, we continue to use the standard recommendations. To scout for rice stink bugs in the field, use a 15-inch diameter sweep net, take 10 sweeps at 10 different areas around each field. Count the number of bugs collected after every 10 sweeps. In the first two weeks of heading, treat fields when there are 30 or more bugs per 100 sweeps. Pesticides that can be used include malathion, methyl parathion and a variety of pyrethroids including Declare, Karate Z, Mustang Max, Prolex and a number of generics. From the dough stage until two weeks before harvest, treat fields when there are 100 bugs per 100 sweeps. When approaching two weeks before harvest, you can treat with any of the chemicals listed above with the exception of Karate Z and Prolex, which have 21 day pre-harvest intervals. You can learn more about rice stink bug biology by clicking here. Resistance to pyrethroids has been increasing in Texas, and there is a chance that we could have some issues with resistance developing in Louisiana also. If you have a field where you are finding it particularly difficult to control the rice stink bugs with your traditional control strategies, please contact me so we can sample the insect population. If you have further questions about rice stink bug management, please contact your local County Agent.